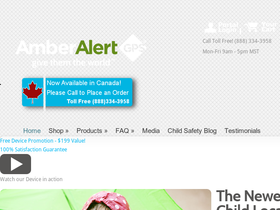 Visit Amber Alert GPS online at AmberAlertGPS.com for a product to keep track of your child. If you have a child, you know the panic that strikes when you can't find them even if it's just a moment. The Amber Alert GPS was founded by Russell Thornton, a concerned parent who has felt that desperate panic of losing a child temporarily. Save on your next purchase from AmberAlertGPS.com with Amber alert GPS discounts, Amber Alert GPS coupons and Amber Alert GPS savings found here on 58Coupons.com. Just use this promo code on AmberAlertGPS.com and you can save $129 off your tracking device purchase. Click link to start. When you sign up for the 2 or 3 year Unlimited or Premium programs, you'll save 20% off the yearly price from AmberAlertGPS.com. Click link for more details. Add voice monitoring with AmberAlertGPS.com for just $9.99 per month. Click link. Check out AmberAlertGPS.com and they'll send you a free child safety package with your purchase. Click link to start. Get the Amber Alert GPS for free when you rent with AmberAlertGPS.com. Click link to start. Act now and click link to get monthly plans with AmberAlertGPS.com from as low as $9.99.